It's hard for us to imagine today, in this Post-Modern era of an international art world, or even in the context of the last century when the United States so dominated the world of art after WW II, but a hundred years ago, in the early years of the Twentieth Century, this country was an artistic backwater. We were only vaguely familiar with the artistic trends rocking the European art scene and largely ignorant of the movers and shakers of the dozens of art "movements" terrorizing the staid art establishment that had so dominated France, England, Spain, Italy, and Germany for so many years. 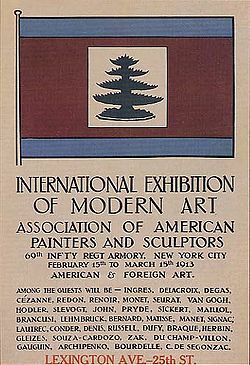 Art in America had only recently assimilated Impressionism and was still, in fact, debating it's finer points long after the style had become almost antique in Europe. A number of American artists of the time had in mind to change all that. They counted among their membership men like Walt Kuhn, Arthur B. Davies, William Glackens, Robert Henri, George Bellows, John Sloan, and Maurice Prendergast. Davies and Kuhn spent the summer of 1912 in Europe rounding up a selection of works representing all the current art movements. What they brought back with them was over 1300 works representing 300 different artists. The list read like a who's who of Modern Art. Names like Cezanne, Gauguin, Van Gogh, Matisse, Picasso, Braque, Kandinsky, Derain, and Duchamp were shown side by side with American artists, Stuart Davies, Marsden Hartley, Edward Hopper, John Marin, Joseph Stella, and others. 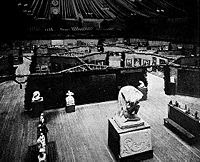 The show opened on February 17, 1913 in the Sixty-ninth Regiment Armory in New York to an audience of over 70,000 people. A smaller version of the show traveled inland to Chicago, and later to Boston. The effect was stunning, also scandalous and amusing as a naive American public struggled to come to terms with the European artistic invasion of their native shores and sensibilities. American art would never be the same again. Hiding Cracks in the Plaster?